Ice Caves synthesizes the latest research on ice caves from around the world, bringing to light important information that was heretofore buried in various reports, journals, and archives largely outside the public view. Ice caves have become an increasingly important target for the scientific community in the past decade, as the paleoclimatic information they host offers invaluable information about both present-day and past climate conditions. Ice caves are caves that host perennial ice accumulations and are the least studied members of the cryosphere. They occur in places where peculiar cave morphology and climatic conditions combine to allow for ice to form and persist in otherwise adverse parts of the planet. 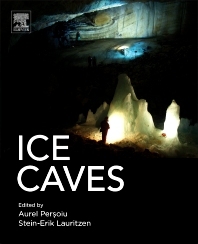 The book is an informative reference for scientists interested in ice cave studies, climate scientists, geographers, glaciologists, microbiologists, and permafrost and karst scientists. Aurel Persoiu is senior research fellow at the Emil Racoviță Institute of Speleology, Cluj Napoca, Romania. He has 17 years of experience working in ice-cave-related topics, acquired while working toward his MSc (2002) and PhD (2011), as well as during his professional career at Emil Racoviţă Institute of Speleology, University of South Florida, and University of Suceava. During this time, he has co-authored one book and several book chapters, written 13 articles in peer-reviewed journals and delivered more than 100 conference talks at meetings throughout the world on various topics related to ice caves. He organized the First International Workshop on Ice Caves (Cluj Napoca, Romania, 2004) as well as co-organizing several succeeding ones (2011, 2012, 2014). In 2007, he initiated the Working Group on Ice Caves within the International Speleological Union (UIS) and served as its first president between 2007 and 2009, and is currently the vice-president of the Glacier, Firn, and Ice Caves Commission of the same organization. Stein-Erik Lauritzen is professor of speleology and quaternary geology and head of the Uranium-Series dating laboratory at the University of Bergen. His research interests span over glacier ice-contact speleogenesis, chemical kinetics, quaternary geochronology as applied to caves and landscape evolution, and the extraction of environmental information from speleothems and other cave deposits. He has worked with cave fauna and aDNA on the ancient brown bear population in Norway, and on dating early Homo sapiens artefacts in South Africa. He is an active caver, and thus enjoys cave exploration and mapping. He is a member of Centre for Early Sapiens Behaviour (SapienCE), and Bjerknes Centre for Climate Research at Bergen University, and is an honorary life member of the National Speleological Society in the U.S. He was featured in a documentary on climatic research from caves and in a National Geographic documentary concerning the formation of giant gypsum crystals at the Naica Mines, Mexico. He is the initiator of the symposia series “Climate Change: The Karst record” of which the first was arranged in Bergen in 1996.